Futterneid. The Germans have a word to describe the specific kind of envious desire you feel for good-looking food on someone else’s plate – and ‘futterneid’ is it. I learned as much recently, courtesy of the BBC’s Nicky Campbell, via the radio on our long-term Volkswagen Arteon. Like much of the rest of the car, the radio is entirely good, adequately powerful and very usable – although not what you’d call special. Regrettably, I’ve no idea if the Germans have a similar term to describe how you might jealously regard the car in someone else’s parking space – but, sufficiently encouraged that they may, we’ve been doing our best to find out, over the past eight months, whether one of Germany’s less fanciable family-sized fastbacks could inspire such an inkling after getting to know it better. The kicker was that we’d be engaging with this VW at its most ordinary: with the cheapest available petrol engine and trim. Desirability has, over the years, proved a difficult concept for a brand as progressive as VW to master. So has its latest fashion four-door got enough of it? Now that our long-term test is at an end, after nearly 10,000 miles, the verdict’s in – and the feeling of the Autocar road test jury is much as it was when we road tested the Arteon in the spring of 2018. It’s not a desperately positive note on which to start this farewell to what has been a near-ideal means of transport for a small group of colleagues who tend to get plenty of driving jollies from other sources. But sadly, even after extended acquaintance has made us regard this car’s comfort, practicality, usability and perceived quality very highly, it hasn’t proved that the Arteon has the dynamism to make it feel any more special to drive than the next mid-sized saloon. Not, at any rate, at rung number one on the model derivative scale. Neither has simply looking at the car at length, and on a daily basis, really given us any greater appreciation of an exterior design that fails to create much in the way of instant visual attraction. We all agree that there are bits of the styling we like but none of us would say those bits come together to amount to a car that really stands out – unlike the previous long-term test car we ran, the directly comparable Kia Stinger. The Arteon deserves some credit, nonetheless, for maintaining a convincing aura of calming cut-price luxury and refinement over its time with us. We went out of our way to test the car in as close to basic specification as possible and yet still got a car with heated seats, digital instruments, adaptive cruise control and plenty of useful convenience features chucked in as standard. The car also repaid us for stumping up for a dual-clutch gearbox with a slickness of operation in unhurried town and rush-hour motoring. In fact, the Arteon soothed away long distances and the drudgery of the daily grind very quietly and comfortably – and it proved that, while you might want to add adaptively damped suspension to your car to make it a bit more athletic, you don’t need it to obtain a fine and absorptive ride. There is a maturity and polish about the Arteon’s driving experience that, while no substitute for driver engagement, certainly feels nicely accomplished. The interior, restrained and downplayed as it is, didn’t accumulate a single sign of age or wear over our test – and it saw plenty of use. The Arteon ferried four 20-something lads on a weekend camping trip. Stacked to the roof, it played a support role for a brave 15-year-old’s long-distance coast-to-coast charity run. Similarly loaded, it conveyed a family of four to the Devonshire seaside for a week of suncream and sand being smooshed into the upholstery. It was adopted by both of Autocar’s staff photographers – neither of whom is known for being too careful about where he chucks his Peli cases or empty coffee cups. But you wouldn’t have known any of that on the day VW took the car away. What’s more, the litre of engine oil I bought in week one was still sat, unopened, in one of the handy storage cubbies on either side of the large and accessible hatchback boot. The Arteon has, in short, provided serene, intuitive, spacious, convenient and relaxing transport, even putting in the odd 50mpg touring run to prove it can be economical, too; but it was the kind of transport you’d expect of any mid-sized saloon from VW. In fact, from its slightly ordinary looks to its perched driving position, and from its only just about adequate performance to its occasionally wallowy body control, our Arteon seemed to decline almost every opportunity to stand up and be counted as special – which brings us neatly back to where we began. Because although not every car needs much in the way of dynamic character or a striking sense of visual style, cars like the Arteon – cars explicitly intended to stand apart from the saloon car norm – really do. And when they don’t have such things to fall back on? Well, it’s all a bit subjective, I have to admit; but, for me at least, all the space, refinement, comfort, usability and good cruising manners you could ever hope for wouldn’t make up for the deficit. When I wanted a car for five days that was comfortable, economical, quiet and otherwise completely undemanding, the Arteon hit the spot. Car as white T-shirt or cup of unsweetened tea. Over a long spell, perhaps you want more than that. Cruising manners Engine is quiet and smooth and the ride cushioned and isolating. The miles simply melt by the window. Practicality Second row’s properly adult-sized. Boot’s bigger than in plenty of SUVs below the window line. Equipment levels You get plenty of kit as standard, among it all a selectable driver profile system. Driving position The seats are comfy but they perch you up much too high for anything like a sporty driving experience. Handling Entry-level specification doesn’t give the Arteon any sporting edge to speak of. And it needs some. Because I have constant access to new cars, my mates have taken it upon themselves to designate me group taxi driver. And on a recent trip, I used our Arteon to ferry some of them from London to Portsmouth. Now, the big VW isn’t what you’d call exotic, but they were rather taken by its dashing looks.“Pretty posh” was the general consensus. Oh, and they had lots of room in the back, too. Our long-term Volkswagen Arteon’s turbo four-pot petrol engine may never run better than it does right now. That thought occurred to me the other day while hoovering quietly down the M40, as I glanced down at an improving long-term test economy trip computer reading and an odometer closing in on 10,000. Any useful loosening this motor’s ever likely to do should now be done, surely; but not so much has yet happened that might adversely affect overall efficiency, performance or refinement. Now would seem as good a time as any, then, to review how our decision to avoid the four-cylinder diesel motor you might feel obliged to pick in a car like this, and plump instead for VW’s latest downsized petrol, has panned out over the past six months. The opinions of the Autocar road test jury, who’ve collectively been running the Arteon, vary a bit on this subject. Ricky Lane went on record in our last report with memorable compliments about the motor’s demure cruising manners, but he’s also used the term ‘insipid’ to describe its performance. Strong stuff. In my book, this is an engine with a few pros and cons. Personally, I wouldn’t use the ‘I’ word, but neither am I convinced that its refinement and economy entirely make up for the fact that it’s only got 184lb ft to motivate more than a tonne and a half of kerb weight. At times, particularly when you’ve got a disappearing gap in traffic to squeeze into, or some uphill overtaking to do, the biggish Arteon does seem short on muscle. Most of the time, though, you just don’t notice – primarily because the softly set suspension makes it starkly plain that this is a car for a relaxed, rather than an enthusiastic, rate of progress. But the engine’s cruising economy does improve by a worthwhile return once you’re used to getting the best from its Active Cylinder Technology. This is the system by which the inline four can effectively switch off cylinders two and three under part load, by sliding sideways the individual exhaust and induction cams that aspirate them and shutting down the fuel injection components. You’d imagine that kind of system makes a contribution to the efficiency of the engine whether the driver’s aware that it’s there, and of how it works, or not. While there’s an icon that appears in the corner of the Arteon’s rev-counter to tell you when the motor’s running in partially shutdown ‘eco’ mode, you don’t hear or feel any hint of a change in the combustion. But learning, as I have of late, that the engine will only activate ‘ACT’ between 1400rpm and 4000rpm, only up to 80.7mph, and can only produce up to 74lb ft of torque when it has, means you can adapt your style to keep it ‘deactivated’ for longer. So I’ve moderated my habitual motorway cruising speed down from 80mph to 75mph (which the Arteon’s engine seems more easily to be able to maintain on 74lb ft), I’m using ‘economy’ driving mode as a default, and the car’s fuel economy’s significantly improving (it’s just ticked through 44mpg overall). On a recent 200-mile return airport run, I saw better than 50mpg: a first. Isn’t it nice when geeking out about pistons and camshafts actually saves you a few quid? Not exciting, granted; not much about life with a VW Arteon is exciting. But, still, it has its advantages. Driver profiles My own preferences for radio, instrumentation and so on are saved in my profile. Great when I spend so little time in the car. Bland styling A car like this ought to have a visual wow factor. The Passat CC did, as does a Peugeot 508 and a Kia Stinger. The Arteon just doesn’t. Between 1400rpm and 4000rpm, our Arteon’s 1.5-litre Evo engine can close the valves supplying fuel to two of its four cylinders. It happens only under the lightest of throttle loads – or none at all – and the transition is all but seamless. It’s hard to isolate the benefits, but I can tell you the car’s fuel gauge clings gamely to the right-hand margin in town driving. Much has been made of this car’s ability to swallow just about anything. Our photographers – who can’t go anywhere without a wagon train of equipment and will throw a pre-arranged loan car back in a road tester’s face if it’s a touch poky, bless ’em – love it. That they disappear off in the thing for days on end, ghosting about the country to locations far and wide, also says something about the Arteon’s easy-going manner. It’s true that the sweeping dashboard, perched driving position and delicate steering action combine to make guiding the car a detached but effortless experience. In fact, for something that is only a Coke can shorter than a 5-Series and wider still, I find the Arteon weirdly easy to put down the clotted suburban streets near my north London home. Easy and also eerily quiet, considering the asking price for a 1.5 TSI-equipped model like this is only a smidge above £30,000. Road test data proves as much: at a steady 50mph, the Arteon’s cabin noise was measured at 63dB. Within the wood-trimmed cabin of the £191,500 Bentley Continental GT, it was 62dB. And that particular Arteon had the more vocal (and, okay, usefully more powerful, at 237bhp) bi-turbo diesel in its nose. I therefore wouldn’t be surprised to find that this petrol example is even quieter than the Conti. As an owner, that would make me feel preposterously smug. But back to this car’s practical inclinations, which, let us not forget, contradict everything Volkswagen wants the fancy fastback swoop to say about the Arteon. Autocar had a Porsche Cayenne in during the weekend of my recent house move. It was an ideal tool for the job, what with 1710 litres of seats-down load space and self-levelling air suspension. But deadlines for longtermer reports wait for no man or woman, alas, and so the Volkswagen was enlisted on the basis that it would either prove surprisingly adept or ruin my weekend. Either way, we’d have a story. To say the car aced it would be overstating things, but I reckon we ended up making 30% fewer trips than anticipated. There are two factors at play here. The front of the Arteon’s cabin might be bland but it is enormous. Where your passenger would normally luxuriate in all that space, on this weekend that person was instead cocooned in shoeboxes, lampshades and the other awkward items that form the moving-list postscript. The second factor is less obvious. That slinky silhouette is indeed deceptive, because the Arteon’s seats-down carrying capacity is more than 1550 litres. That’s not far off the gargantuan Porsche, is it? The boot opening is wide, too. Yawning, in fact. Sliding in a modest kitchen table and four chairs was a process so free of hassle that it could be the single most endearing thing about this car. 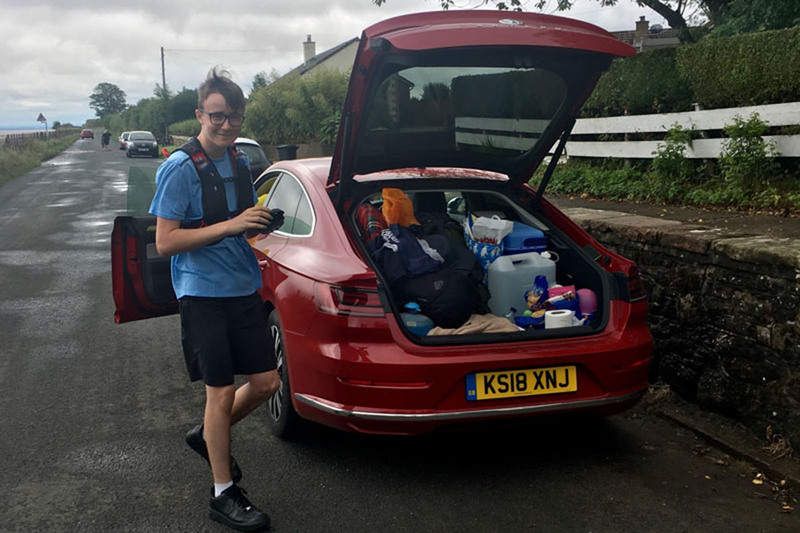 In more objective terms, I’ve read the Arteon, with the rear seats up, swallowed eight carry-on suitcases when it underwent What Car?’s legendary luggage test – that’s more than either the Audi A5 Sportback and the BMW 4 Series Gran Coupé. We never should have doubted that a flagship VW, even one plugged as an avant-garde statement of the brand’s creative potential, would have a resolutely pragmatic core. And I think you’d be foolish to ignore that. If you want a car with four doors it’s because at some point – perhaps on a daily basis – you need the space. Volkswagen can’t match the sophisticated brand cachet of the Arteon’s home-grown rivals and this particular engine is insipid, but nothing in this clique is so versatile or affordable. SWEET STEERING Thin-rimmed steering wheel puts me in mind of Hudson Hornet. Action is light but consistent and really suits the car. UNREFINED DRIVELINE DSG driveline shunt when stepping off the mark: it’s a great way to undermine the luxury vibe. The Arteon has been a welcome change to recent smaller cars. I had no problem squeezing bulky equipment cases and a tripod into the boot, and I like the badge-cumboot release, which lets you open the boot with one finger and without groping for a key. Now I just need someone to tell the road testers they can’t have the car back. I’m beginning to feel that the extra layer of everyday-use dynamic sophistication you find in other VWs just isn’t going to materialise from our Arteon. On a drive to Anglesey Circuit, the car was quiet, comfy and frugal (48mpg) – but performance still feels undernourished, while it neither rides nor handles particularly well. An ordinary drive seems like a failure from this car. I haven’t exactly warmed to our Volkswagen Arteon long-term test car over the course of the two months we’ve been running it. That’s not because I think it’s a bad car – far from it – but it’s easy to overlook the VW’s subtle charms when I’m distracted by some of the more engaging and exciting vehicles in the car park. However, there are times when a big, comfortable and refined saloon is just about the most desirable car on earth. I recently had one of those times when the vagaries of Autocar’s test drive schedule meant I had to fly from Europe to the UK late one night and then fly back to the country I’d just returned from for a different test drive the very next morning. I know, ‘first-world problems’ and all that. And so at 4.30am – bleary-eyed from the previous day’s flight and with toothpaste still clinging to the corner of my mouth – I climbed aboard the Arteon to drive back to Heathrow from my overnight bolthole. From the moment I lowered myself down into the seat, I couldn’t think of another car on our test fleet that I’d rather be in. Firm suspension, unforgiving bucket seats and a loud, raucous engine weren’t really what I was in the mood for, and the Arteon succeeded by not featuring a single one of these things. I imagine my snoozing neighbours were equally appreciative that I wasn’t firing up a frenzied performance car. Instead, I turned the seat heater on and set the climate control to offset the early-morning chill, aimed the sat-nav at the short-stay car park (not that I needed directions for such a familiar journey) and tuned the DAB radio to BBC Radio 6 Music so I could listen to whichever DJ was unfortunate enough to be awake at the same time I was. And despite the ungodly hour, it was a pleasant-enough journey. Our passively damped, front-wheel-drive Arteon – which is fitted with 18in wheels, the smallest offered – rides with the pliancy and suppleness you’d expect from a big executive saloon, so you don’t emerge at the end of your journey broken and defeated, although it does have a tendency to thunk over the odd lump or bump. The turbocharged 1.5-litre TSI Evo petrol engine is quiet and unobtrusive at speed, and the driving position is comfortable, with the as-standard nappa leather seats offering a blend of six-way electric adjustment (for the seat backs and lumbar support) and manual levers (for all of the other settings). For these sorts of trips – you know, the ones you really, really don’t feel like making – the Arteon just works. I arrived at the airport car park still not quite feeling fresh, but certainly a hell of a lot more relaxed than I would have been in, say, a Renault Mégane RS 280 Cup. So being reserved and prioritising comfort over raw driver engagement isn’t always a bad thing, then. Am I any more enamoured with the Arteon’s under-the-radar vibe, though? Well, the fact I forgot where I parked it immediately after I arrived back at the airport terminal might answer that question. Just as well we spent an extra £595 and specified our car with eye-catching Chilli Red metallic paint – it stands out a mile. SMOOTH RIDE Soft chassis set-up makes for a comfortable long-distance tourer, if not a particularly exciting or engaging one. DSG GEARBOX Generally smooth and responsive, but at low speeds it can be slow to find the right gear and can deliver a bit of a shunt when it does. Can a hatchback/fastback do everything an estate car or SUV can? I didn’t plan on finding out, but logistical headaches meant I had do. Pictured here is my lad, Red. Red is 15, and before the summer break he came home from school and said he fancied swimming the English channel during the holidays. Which is fine, we said, but are you sure you can swim that far? Besides, where do we get the goose fat? Alright, he said, how about I run from one side of the country to the other? Great, we said. At Hadrian’s Wall, which stretches from Bownesson-Solway to Wallsend (obvs) in Newcastle, England is 84 miles wide. Running the length of that, to somebody like me, whose plans for my summer holiday at Red’s age included ‘playing a bit of snooker’ and ‘having a nap after a tiring game of snooker’, sounded amazing. Red reckoned it would take five days and found a charity based near the run’s end to raise some money for. So I arranged to be in one of our long-termers, a practical 4x4, to support him. Only then I had to leave it for a colleague at Mazda-tuner BBR GTi’s place in Brackley, because I am an idiot, and found myself in the Volkswagen Arteon instead, wondering if everything would fit. Which it did. In no particular order, what you see here is the kit needed to find a lad out on the road and keep him fed and watered when he’s running 17 miles a day for five days: a 12V cool box, a two-ring stove and gas bottle, a 20-litre water canister, a mountain bike (my 1992 Marin Palisades Trail, classic mountain bike fans), clothing for three for five days, towels and coats and rugs, a parasol and a water-filled base for it, three camp chairs (including one very large one), a helluva lot of food and drink, more shoes/trainers than you’d think necessary, and first aid supplies. Anything else? Probably. I forget. The Arteon’s boot volume is 563 litres with the rear seats in place, 1557 litres with ’em folded – and presumably just under half-way between the two if you fold the 40% split seat down, to leave good occupant space on the offside but enough room on the nearside to squeeze the bike through, with a front wheel removed, as I did. There’s no 12V socket in the boot, alas, but there is one by the back seats. There are also two 12V sockets in the front but only one USB outlet, which is odd for a new car, so I picked up a 12V-to-twin-USB converter, too. The Arteon was brilliant. Its ride is smooth, its seats flat but comfortable over distance, darkened glass good at hiding whatever you have to leave in it overnight outside hotels, and the economy, at 45mpg, impressive: I know it’s only a 1.5 but it is an automatic turbo petrol. Volkswagen routinely turns out smooth-driving, easygoing cars with a consistent, solid feel, and this is a great example. Unspectacular but impeccably quiet, with an unobtrusive engine and generally very easy to rub along with. And the run? It looked like Red breezed it to me, but I wasn’t the one with the sore hip and a falling-off toenail. But anyway, the cross-channel swim is now being mooted for next summer. Does anyone know where I can borrow a Volkswagen Schwimmwagen? PRACTICAL SIZES Sensible wheels and tyres let you roll up kerbs or squeeze into passing places without a scrape. Fields aren’t off-limits, either. BOOT BOTHER An SUV’s tailgate often gives moderate shelter and offers a flat load sill. The Arteon can’t do either but it is much more stylish. I had my first go in our Arteon on the way up to Blyton Park for this year’s Junior Handling Day shootout. Granted, it isn’t as exciting or engaging as the cars that duked it out on track for this year’s crown, but for the 170-mile schlep to the Lincolnshire circuit from Twickenham, ‘Comfort’ was a far more appealing prospect than ‘Cup chassis’. Perhaps I’m getting old. The Arteon is a curious thing, and not only because it’s pure motor show concept from the front but looks like a taxi when viewed side on. Notwithstanding the fantastically slippery XL1 plugin hybrid of 2013, this is the most dramatic design Volkswagen has given us in modern times. And putting aside for a moment the new Touareg SUV, with which the Arteon shares so much of it general aesthetic, it’s also VW’s flagship offering. It’s a level of status at odds with the reality that success for this car largely hinges on its suitability to motorway drudgery. It’s your silver-plated porridge spoon, if you like. This particular Arteon’s specification differs from the norm, mind. A diet of diesel has long been the preference for big-mileage executive saloons, but our fresh-faced long-term test car is propelled by the backstop of the engine lineup: the turbocharged 1.5-litre TSI Evo petrol engine. In a Golf, it’s a compelling proposition and one we’re particularly fond of, with a levity that makes spinning it out a satisfying endeavour but enough torque to ensure you’re never asked to work particularly hard for swift progress. In the Golf, it can also deactivate two of its four cylinders under light throttle loads between 1400rpm and 4000rpm for improved fuel efficiency, and the same is true for the Arteon. Whether its outputs of 148bhp and 184lb ft are as suited to a four-door fastback some 350kg heavier than the hatch is something we’ll discover in due course. Combined fuel economy is quoted at 48.7mpg (the most efficient model in the range, a similarly powerful 2.0-litre diesel, is quoted at 65.7mpg) with CO2 emissions of 131g/km. With a 66-litre fuel tank, that’s good enough for a range of more than 700 miles. Meanwhile, the claimed 0-62mph is 8.9sec, which although far from shameful doesn’t quite cash the cheque written by the assertive front-end design. The spec we’ve gone for is the entry-level Elegance, which is one of only two available in the UK, the other being R-Line. We’ll be swapping one for t’other in a few months’ time, but for now our Arteon cuts a more restrained figure, and does without gloss black air intakes, aggressive bumpers and 19in wheels. The paint is a metallic shade called Chilli Red and costs £595. You can buy an Arteon variously with a manual transmission and with Volkswagen’s 4Motion all-wheel drive system, but ours channels power to the front axle alone, and through a seven-speed dual-clutch ’box that can either be left alone or controlled through a pair of stubby steering-wheel-mounted paddles. 4Motion models come with active DCC dampers and a 15mm drop in ride height as standard, although our car uses a passive set-up. Inside, it’s a bit of a mixed bag, with the stark, clean, expansive architecture left slightly hanging by a range of materials and finishes – notably gloss black and aluminium – that don’t do an awful lot to excite. There’s also a strong whiff of Passat in there, which isn’t surprising given that’s the model with which the Arteon shares its basic construction. The nappa leather seats, meanwhile, are VW’s ergoComfort models with electric adjustment for the backs and lumbar support but manual levers for height and reach. You’d get exactly the same shape in an R-Line Arteon. We’ve been sparing with optional extras in an attempt to hone the Arteon’s appeal as a value proposition relative to its lavish overtones. It means that along with the paint, the only other boxes we’ve ticked are those for the £900 keyless entry with the electric tailgate, which can be opened by swiping your foot beneath the rear bumper, and a £315 rear-view camera. You might have expected VW to throw in a rear-view camera for ‘free’, given this is its flagship saloon, but no. One tempting option we didn’t elect for is VW’s £985 Discover Navigation Pro infotainment system, and there’s a good reason why we’ve settled for the standard 8.0in display. Fact is, superb as the 9.2in glass touchscreen of the Pro might look, it does without any physical buttons or switches, so there are no scrolling dials for quick, sightless adjustments to volume and navigation zoom. We’re also far from convinced with VW’s efforts to implement gesture control, which are still hampered by inconsistent response. As it is, the total outlay was £34,555, which places the car, well, where among the alternatives, exactly? You could buy a base-spec Audi A5 Sportback SE for few grand less, but we reckon you’d need to spend at least £38,500 to spec it to a similar level as our Arteon. For one thing, the VW is equipped as standard not only with a 12.3in digital instrument binnacle but also a range of safety-oriented technologies such as predictive cruise control, lane-assist, pedestrian monitoring and emergency braking at city speeds. Of course, there’s an indefinable element to luxury that has little or nothing to do with value for money. What we’ll endeavour to discover during the next few months is whether this car has it or if those who crave the sophisticated aura of a ‘four-door coupé’ and view Arteon ownership as an inexpensive way in should steer clear. I wasn’t a big fan of that wing-shaped front grille on our R-Line road test car, but something about its look on this Elegance-spec long-term test car appeals more to me. And I love the way the chrome bars run over the headlights. Makes the forthcoming 508 look possitively exotic. Makes the Mazda 6 look positively amazing value, too. The old passat cc that this, I think, replaces was a far better looking car, this seems rear heavy and bland where the cc seemed elegant. I am surprised that this is their flagship, I would have expected an SUV like Audi, though I would take a car over an SUV any day. Do you mean the CC, or the Passat cc that came before?. Si73 means either or both, since they were essentially the same car. The CC was simply a facelifted and renamed Passat CC. Don't you have anything better to do with your time other than criticise other people's posts or try to catch them out? I know you like your acronyms, so here's one for you...PITA. Blah, blah, blah. Jonny no mates strikes again. Why are you guys worrying about this thing so much? I think that you guys need to why not look here and then try to find what you need from here. It will be quite useful for all of us for sure. Individuals need to take in some imperative things which they use in the mid-year. Since in summer, we require various sort of homework for me which implies that here everything has numerous significance for us. Since we require this to appreciate in the summer. I can't see too many of these selling in the UK, a decent secondhand buy though no doubt!